Anyone who knows me knows how much I love hearts. I love to paint them, I own heart-shaped jewelry, I love to see heart shapes in other things. I also really love rocks. 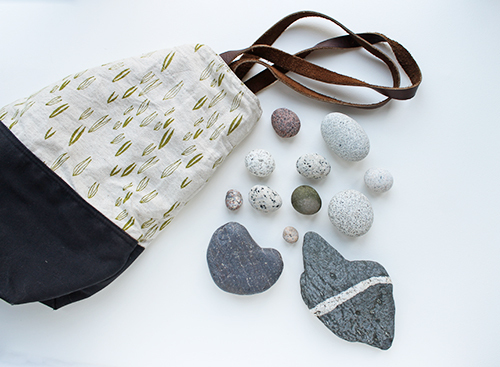 The heart rock collection above was gathered on our holiday this past August in Maine. I actually have more of them than I was able to fit in the photo. 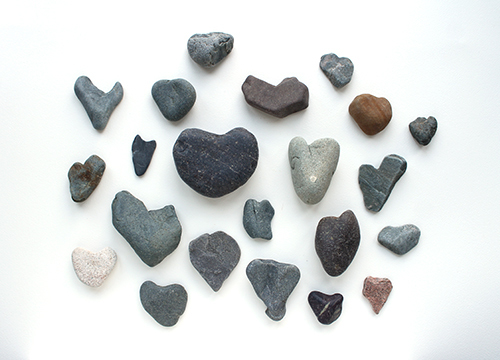 I can't tell you how much pleasure looking at these gorgeous heart rocks gives me. I love that there are smooth ones, wonky ones, broken ones, light and dark. Don't all of our hearts go through all of those stages at some time or another? Some of these rocks are particularly nice to hold. The great big, smooth rock in the centre came from Jasper Beach in Maine. It is the most extraordinary place. Mounds and mounds of ocean-sculpted, smooth jasper stones. 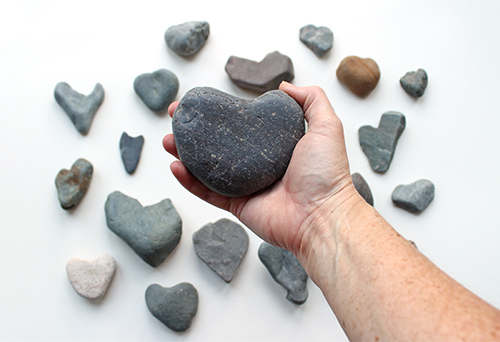 That big heart is so beautiful and just might be the ultimate worry stone. In April, I showed you a painting I did of a gorgeous tree that lives in the forest where I walk with Meeko during the winter. It has the most wonderful heart shape on its trunk. I finally made my painting into a print and added it to my shop this week. I am very happy with how it turned out. 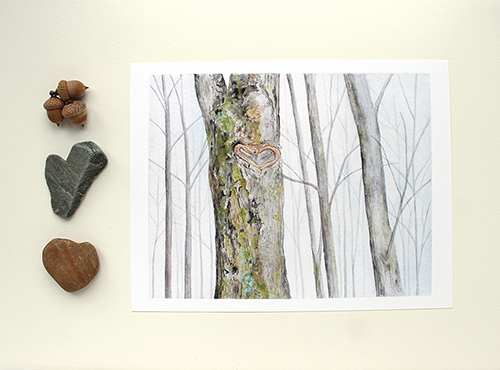 I did the original painting in gouache as I wanted to make sure that all of the woodsy, earthy, mossy tones came through on the beautiful tree trunk. The print has captured the original's tones very nicely. I also found some beautiful egg-shaped rocks. I'm like a kid when I'm on the beach. I get so excited about shells, sea glass and all shapes of rocks. Look at these beauties! I wonder if Arounna from Bookhou ever wonders about the treasures that her beautifully made bags carry. My wonderful rock collection was transported in a Bookhou bag from the coast of Maine back to our home. Thank you for your patience with me in past weeks. I came back from our holiday in early August fired up and with the best intentions of posting on my blog more often. Well and then I didn't. (Did you wonder if our house had been surrounded by the black-eyed susans in my last post?) I've missed you all and hope to be here more often this fall. Both Emma and Chloé are now back to school. After a very slow summer, I've started to sell again in my shop. (Yay!) I've added new prints and some more originals, so please have a look. I'll be adding more in the weeks ahead. The next month will be busy. I have a special commissioned painting to work on (maybe two) as well as a craft show to prepare for. I'll see you here! 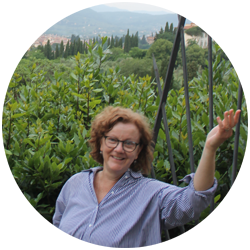 It's always a pleasure to visit your blog Kathleen! Your tree with a heart print is lovely. 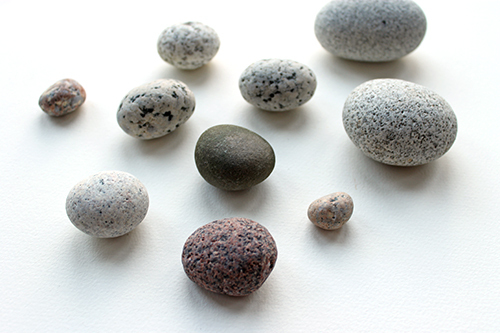 I also love to collect pebbles and stones, I still have some I collected as a child! Love your summer treasure specially the egg-stones. Ravie de vous voir de retour sur le blog. Je vous souhaite de passer de bons moments à peindre. C'est une telle joie de pouvoir créer n'est-ce-pas ? I always notice these types of natural shapes too. My kids used to think I was ridiculous point out leaves and bark and trees and roots and shapes and colors, etc. Glad I am not alone in that. La prochaine fois que j'irai à la plage, j'espère y trouver un coeur pour te l'envoyer ! I am not going to improve my english this way, your collection is stunning ! Pas de problème! Hélène me laisse des commentaires en anglais et en français. J'adore ça! I'm glad you had a good summer, Julie, and I'm glad to see you here! We had a great summer too. Family visits and a couple of trips. It sounds like you are busy! I barely blogged over the summer and missed visiting others' blogs. It's hard to do it all but I hope to blog more this autumn. I enjoy it. Stay in touch!